Samsung has introduced two new products that are slightly modified versions of previously released Android-smartphone Samsung Galaxy Y and Galaxy Y Pro. The devices have the same names but with prefixes Duos - both models are equipped with slots for two SIM-cards. Samsung Galaxy Y Duos equipped with 3.14-inch touchscreen display with 320 x 240 pixels. At Galaxy Y Pro Duos 2.6-inch display and touch too. Latest smartphone features an QWERTY keyboard and front camera for video calls. Both models run on Google Android 2.3 Gingerbread with 832 MHz processor. As smartphones have Wi-Fi, GPS, Bluetooth 3.0, a slot for memory cards microSD, 3 megapixel camera, support networks of 3G. 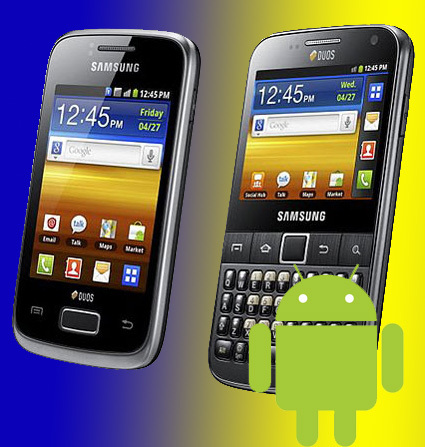 The first Galaxy Y Duos and Galaxy Y Pro Duos will appear in Russia in January next year. Samsung Galaxy Y Duos would increase the world than his brother.